codeREADr’s barcode scanner app now offers the ability for access control teams and security patrols to view the photos of members, students, employees, visitors, and contractors as the barcode on their ID is scanned and validated. As usual, the codeREADr barcode scanner app checks the barcode value against a database of IDs. 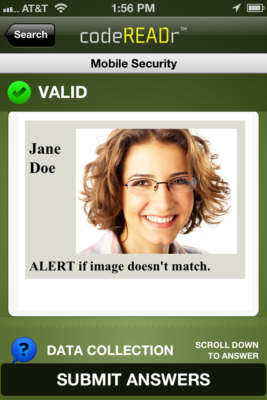 But now, codeREADr can also present the app user with a photo of the ID holder. If the ID is not in the database, the app user will be prompted that the ID is invalid then be presented with instructions for handling the situation, optionally including a phone number to alert others. By enabling smartphones and tablets to be used for mission-critical applications, codeREADr aims to lower the bar for broader deployment of the tools necessary to tighten access control and mobile security at venues, on campuses and at places of employment. Our goal is to allow event organizers, venues and businesses to authenticate IDs more frequently and validate IDs anywhere, whether at the point of entry or anywhere on premises. Using codeREADr’s web services or extensive APIs, you can define the workflow; decide what data to collect; create credentials for authorized app users; and import databases. For situations where data are strictly confidential, you can host the database on your own servers. In all cases, data posted to and from the app is securely transmitted via SSL. To see what this looks like on a phone or tablet, simply download the codeREADr barcode scanner app from the app store and create a free account. After signing in, select the service called ‘Mobile Security’ and, from a device other than the one you downloaded to app to, go the the codeREADr demo page to find corresponding barcodes to scan. Scan the ‘Webify’ barcode and you will see the image shown at the beginning of this post. How can you add this Webify functionality to your codeREADr services? It’s pretty straight forward but generally you’ll need to involve your IT department or Web developers, especially for the more sophisticated deployments. HTML code and image replace the textual information normally presented to the app user after a scan. To present the ID holder’s photo, you’ll need to have each image associated with a unique URL. You could use Dropbox, Google Drive or similar services, or you can use your own servers for hosting those image URLs. Below is the HTML code used in the Mobile Security demo service. It’s relatively simple when compared to the way you can contextually present information in the app. However, it is quite effective for this use case. ALERT if image doesn’t match.